Sunday saw me complete my second ever half-marathon, having completed the Nike Run to the Beat last September in 1:44 I was keen to improve on that and, if possible, get close to being under 1:40. My biggest concern before the race day, as I mentioned previously, was the weather. I didn’t want it to rain, and I did NOT want it to be windy, given the choice, I’d rather have had a cooling shower on me than a headwind. Sadly, I didn’t get my way and the open nature of the Silverstone track meant that the wind was howling the entire duration of the race. Pre-race didn’t start well, I tested my ever-loving wife’s patience by forgetting things in the car, not once, but TWICE, the second time was 30minutes before the race was due to start and the car was parked nearly a mile away, with all the foot traffic coming the other way back at us. Luckily we were able to get back and get what I needed and was back in time for the race to start. My wife then found her way to the cheer point run by the charity she works for and I elbowed my way to the start line, being careful to not try and get too near the front and get in the way of the real fast runners. My goal was to get near to 1:40, which is averaging 7:38min/mile for the whole 13.1miles, I wanted to start strong but run long and save some energy in my legs for the final few miles. I’d was on track for 1:40 at Run to The Beat before crashing hard in the last 3/4miles and didn’t want to go through that again. After a brief interview the the men’s race favourite (who for some reason chose Aqua’s ‘Dr Jones’ as his pre-race song of choice) and Paralympic hero David Weir, we were off! As you can see in the above image, the grandstands were full as we set off and started to burn rubber down the straight (sadly not as fast as an F1 car). The support up in the stands and around the start was fantastic, it felt really good to be running on the race track where the greats of F1 have all raced. Within half a mile though, the support had disappeared, this was my single biggest gripe with the day as there was only really 3 places on the course where it was possible for the supporters were close enough to cheer you on. It seems F1 tracks aren’t designed to allow spectators close to the track where cars travel at over 200mph ,who’d have thought?! For me though, the lack of support made it a bit boring, by far the least supported race I’ve done so far, for the vast majority of the three-lap course, the only thing you could hear was the pounding of feet on the track and the ever-present flapping of race numbers in the strong wind. As a compulsive high-fiver I was most disheartened to not get a chance to high-five anyone until mile 6.5! I was also the only person that was putting in a concerted effort to sound like an F1 car whilst cornering “Neeeeooooowwww!). As for the race itself, it went very much to plan! I wanted to try and be around 7:35min/mile at mile 10 and then see how strongly I could close. I started somewhere between the 1:30 and 1:45 pacers and eased into my pace. Miles 1-4 went by smoothly, 7:30, 7:33, 7:36, 7:35. Then the wind picked up! The curious thing about running when it’s windy is that when it’s blowing into your face you feel every step is twice as hard, yet when it’s blowing behind you, you feel nothing. You don’t get the same benefit of the wind pushing you forwards. The general rule of thumb is you only get back half of what you put into a headwind when you turn around and run with it at your back. It didn’t feel like that on the day and miles 5 and 6 were when the wind came up strongly and I did a couple of 7:40-somethings. At the half way point though, we were back among the crowds, I was still feeling strong, and I’d just had my first high-five! This, combined with the shelter from there being more buildings at this part of the course mean that I was able to do a couple of miles in the 7:30’s, and then mile 9-10 went 7:26, 7:27, even with the wind really starting to pick up. I’d got my pacing perfectly heading into mile 10 at an average of 7:34 per mile. Right on track for a final push. With 5k left it was time to try and bring it home, but again, the course moved away from the support and got out onto the open track where the wind was blowing stronger now than ever. I also go to see my lovely wife for the first time which was the perfect pick-me-up. Mile 11 was a strong 7:25 and I felt good, but mile 12 was a bit more effort as started to feel a tightening pain in my right shoulder and side, I think from tensing up so much whilst running into the wind. I eased back a bit to a 7:38 mile and tried to get it under control before finishing strongly. The final mile was my fastest of the race, a 7:19 into a headwind the entire way and then a final 0.1miles at 6:30 pace proved that I’d paced things well. 49:51 for the first half of the race, then 48:15 for the second half, for a 1:39:06 overall race time. A lovely negative split, and I finished knowing that there was more in the legs. I wasn’t going to blow myself up trying to shave off a few extra seconds when I have a marathon in 5 weeks as my main goal. I’d finished nearly a minute ahead of schedule, in howling winds and I was happy. David Weir said post race that it was the worst conditions he’d every done a half marathon in, I’m inclined to believe him. I don’t doubt for a second that I could have got another minute, maybe two off my time if it hadn’t been so windy. Now the half marathon is done, I need to get right back on my marathon training if I’m going to beat last years 4hr07min marathon time from last year. First race of the year and I’ve not really trained for it, I’m using it more as part if my Brighton Marathon training and to test things out for race day. I’d still like to beat my 1hr44min Half marathon PB. I’m nervous about the weather currently. 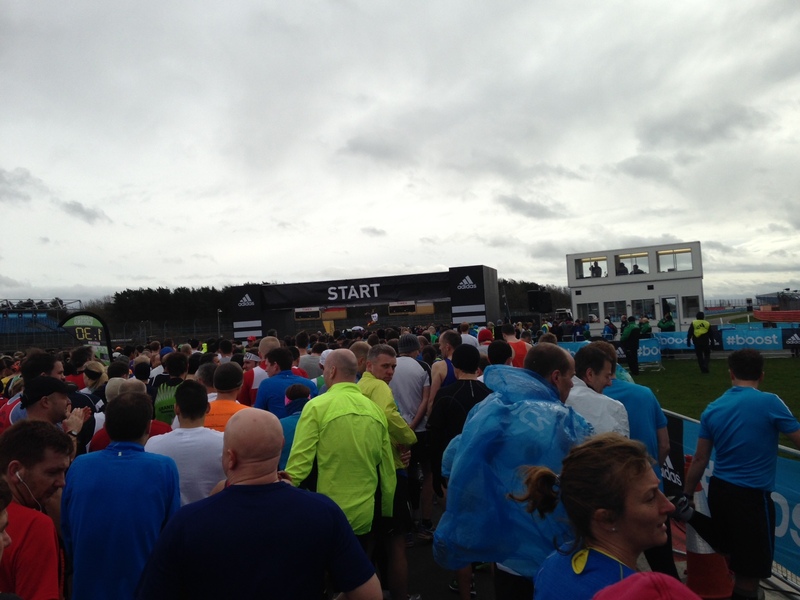 The course is flat as a result of it being an F1 circuit, only around 60m of elevation across the entire course. Due to it being flat and in the countryside it’s quite exposed to the elements, so wind and rain on the day could impact any goal time quite notably. I’ll just find a someone bigger than I am to slipstream! 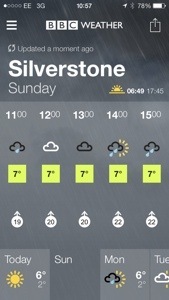 Before then, I’ll be praying that the little bit of rain free cloud is in place for race start at noon. Also hoping for good weather so my ever-supportive wife isn’t stuck out on her own watching me in the wind and rain. 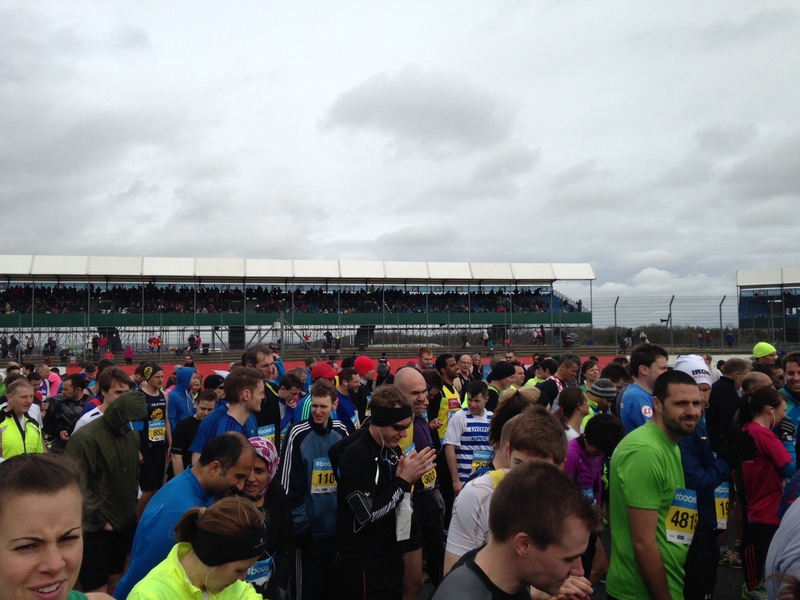 Hoping for good weather for all runners this weekend. If you’re racing, good luck and run long and strong!